Isaiah 6:1 Isaiah’s Call as a Prophet of God. Isa 6:1 In the year that King Uzziah died, I had a vision of the LORD. He was on his throne high above, and his robe filled the temple. The death of king Uzziah fixed the time of this vision . 2Ch 26:19 Uzziah, who was standing next to the incense altar at the time, was holding the incense burner, ready to offer incense to the LORD. He became very angry when he heard Azariah’s warning, and leprosy suddenly appeared on his forehead! 2Ch 26:20 Azariah and the other priests saw it and immediately told him to leave the temple. Uzziah realized that the LORD had punished him, so he hurried to get outside. 2Ch 26:21 Uzziah had leprosy the rest of his life. He was no longer allowed in the temple or in his own palace. That’s why his son Jotham lived there and ruled in his place. 2Ch 26:22 Everything else Uzziah did while he was king is in the records written by the prophet Isaiah son of Amoz. 2Ch 26:23 Since Uzziah had leprosy, he could not be buried in the royal tombs. …I saw the Lord……… [Adonai], or Master In Is 6:5 Isaiah calls Him the LORD of Hosts or Yahweh Saboath: Jehovah who is the Commander of the heavenly Armies, The Ruler of the Universe. Here we compare John 1:18 No one has seen God at any time; the Only-begotten Son, who is in the bosom of the Father, He has declared Him. Isaiah sees the throne, the robe, and the Seraphs but not the form of God Himself. This was different from the Shekinah Presence of the The LORD in the Holy of Holies of the earthly Temple in Jerusalem..
Psa 114:8 who turned the rock into a pool of water, the flint into a fountain of waters. The whole earth trembles at the presence of God. What an awesome God we serve. It was Yahweh the Son who appeared to Him. Isaiah must have seen the Messiah. John 12:41 Isaiah said these things when he saw His glory and spoke of Him. It was from the Lord Jesus that Isaiah received His call to go out and prophesy to Judah. 1Ki 22:19 And he [Micaiah the prophet] said, Hear therefore the Word of Jehovah: I saw Jehovah sitting on His throne, and all the host of heaven standing by Him on His right hand and on His left. 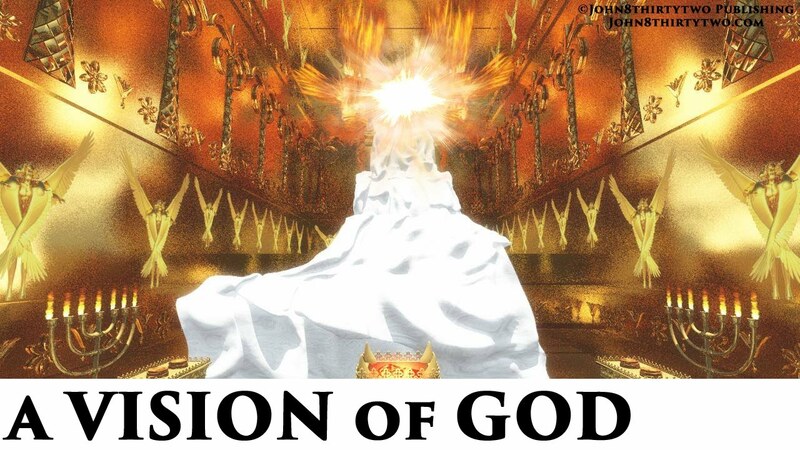 Jer 17:12 Our holy place is a glorious throne, highly honoured from the beginning. It was High and Lifted Up…. Jesus is exalted to the HIGHEST PLACE – He has a Name greater than any other Name. see Phil 2:9 Therefore God has exalted Him to the Highest Place……. He is High and Lifted up in all the world. This is our Savour and Lord. His name is higher than any other. Application : Isaiah had a Personal commissioning from the Lord Himself. Before you go to work for the Lord in Christian Service you need to be called by the Lord Himself. Remember you are serving the One who is awesome and exalted to the Highest Place in the Universe. Next Post Isaiah 6:2-3 Seraphs flying in Reverent Awe.